Mark Street and Jennifer Reeves, former students of Hutton, put out a call for films to honour Hutton, each to be drawn from a single silent 100 foot roll of 16mm film. The call resulted in 35 films that touch down in Vancouver with this out door screening under the stars. 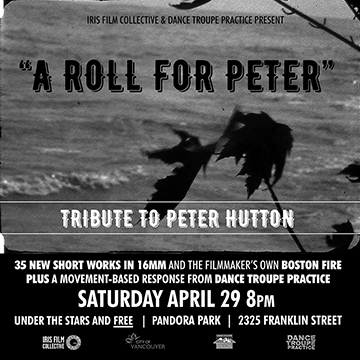 The screening will comence with Hutton's own Boston Fire and include work by: Dominic Angerame, Roddy Bogawa, Cassandra Bull, Jacob Burckhardt, Jesse Cain, David Gatten, Richard Max Gavrich, George Griffin, Eve Heller, Mott Hupfel, Nikolas Jaeger, Amanda Katz & Josh Lewis, Theodore Rex King, Robbie Land, rebecca (marks) leopold, Paul Marcus, Daryl Meador, Mary Beth Reed, Jennifer Reeves, Dave Rodriguez, Peter Rose, Lynne Sachs, Josephine Shokrian, Fern Silva & students, Jordan Stone, Mark Street, G. Anthony Svatek & Zachary Nichols, Eric Theise, Audrey Turner, Michael Wawzenek, Max Weinman & Jake Carl Magee, Timoleon Wilkins.